The ninja warrior as they progressed in time, moved into the separation of unique ninja roles. In the early days the need for roles and classes would have been relatively low, as the ninja was a new force in feudal Japan and a relatively unknown skillset to many. As the word of the ninja and their ninjitsu skills spread, and the ninja schools grew in popularity, the diversity of the skills of the ninja became more specialist. This led to the definition of classes around the Sengoku period, setting out clear roles for specialist ninja to perform successfully in any situation presented to them. We will explore the various roles undertaken by the skilled ninja warriors in more detail. The Kancho was the classic role of the ninja, sometimes referred too as the Sekko as well. This ninja role would play that of a delicate spy that was able to not only infiltrate enemy territory, but provide reconnaissance and information back down the line. The Kancho ninja was typically of Genin(lower man) rank and would pass back information when they could to their commanding Chunin(middle man). The ninja was capable of playing many roles to ensure success. The teisatsu was a scout typically based in reconnaissance in a shorter capacity than the ninja kancho. They were often skilled in Choho, the ninjitsu skill of espionage and would if needed use their skill of Henso-jutsu(disguise and impersonation) to ensure easy passage to any region or town. The kishu were stealthy attackers of the ninja ranks. They were capable of gaining alternative or inside ground when their enemy least expected it. Skilled in both Shinobi-iri(stealth and entering methods) and Inton-jutsu(escape and concealment) the kishu were a vital cog in the ninja machine. The konran, the agitator could be considered a spokesperson working for the cause of whatever the ninja were championing. They were masters of subtle and not so subtle persuasion. The konran were often highly skilled in the ninjitsu art of Bo-ryaku(strategy) and were able to spread rumours, give speeches and generally rally the local population to their cause or concern. The roles defined for the ninja warriors matured as their numbers grew. These roles allowed the growing ninja warriors to easily switch their mindset and skill set to fit the required situation. 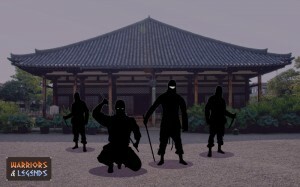 It was this evolution that kept the ninja in demand and a real tool for any force needing to succeed in war or battle.